Read the reviews and comments on the reviews to get the full picture. Note the marmite tone from all those who have written books on the subject - you can tell because they all dont use their real names - we hide nothing and tell it like it is. If you have time to watch my lecture this explains the basic points of the book for those who want to know in an hour and twenty minutes why history has got it wrong." Those of an academic disposition might also wish to read this first The Blog and Follow history as it happens" or even this if you have had the full blown official version from a University academic who is not up to date with the latest understanding of what really happened. ESSENTIAL READING IF YOU LOVE HISTORY. 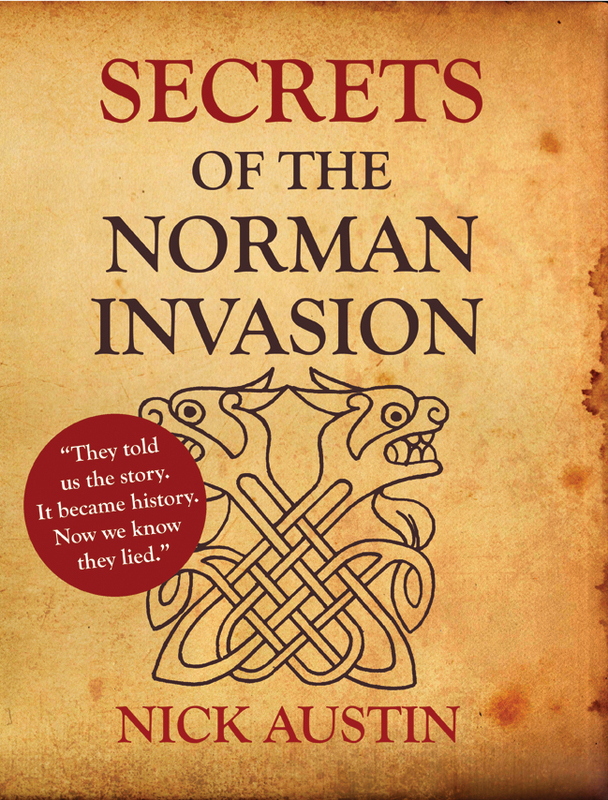 A historical who done it - and definitive reference book for anyone studying the Norman Invasion. Probably the largest National Curriculum research sites in the UK currently between 10,000 and 20,000 different visitors a month (many of which are schools) and over 5million hits since first published. One of the best learning resources on the Net - Number One on Google and most other search engines for "Norman Invasion" for ten years - out of 40billion web pages. If you are studying the Norman Invasion for school or higher education you will find information here you will not find on any other web sites. Dont read the out of date stuff repeated ad infinitum across the academic world without getting the latest information here - this is the latest information - tell your teacher or mentor to check it out - we are changing history here. Throw the books that say the Normans landed at Pevensey away. This site is and has been the leading site for the Norman Invasion subject since first published in 1994 because it proves where the Normans actually landed and confirms that Victorian interpretations of texts were wrong. Described by the Guardian newspaper as "A really good read ". Get the ebook from this page. Sign up as a friend on the Secrets of the Norman Invasion page on Facebook to comment on this web site or for new information. Its a closed group - just ask to join. Note: This document is a proprietary copyright ©document, the copying for anything other than personal or research use is prohibited without the written consent of the author (or where appropriate publisher). Parts may be reproduced for review purposes or educational uses. This site started as a document filed with the Highways Agency in the UK (23rd December 1994) as evidence to be presented at a Public Inquiry to determine the route of the Bexhill to Hastings bypass, since the proposed route passes through the centre of the site being investigated. It has since grown as a result of the subsequent public inquiry and continuing search for evidence. It contains information on one of the greatest stories of human history and reveals more than first meets the eye. I hope that you enjoy the read and are wiser as a result. In order to evaluate the hypothesis contained in this document it is necessary to follow the logic of the document in chronological order. The following work arose out of my insatiable desire to know exactly where the Normans landed prior to the Battle of Hastings. This interest was awakened shortly after moving to the village of Crowhurst (one of Harold's personal manors) where I was able to hear at first hand some of the local accounts of the Norman landing and search for Norman remains in the village. Over the last six years I have tried to read everything important associated with Norman landings and the battle and have spent many months carrying out detailed searches of the documents contemporary with the battle. I have become increasingly alarmed at the discrepancies between the texts and the lie of the land where the landings were supposed to have taken place. In this work I attempt to explain how all these discrepancies can be reconciled only if the contextual references are applied to a landing site different from Pevensey. The text that follows is divided into two parts. The first part deals with the clues to the landing site contained in the contemporary source documents, whilst the second part looks at the physical evidence thrown up by surveys, aerial photographs, field walking and archaeological work. Domesday Map1 (Part 8) - Manors affected by Invasion. Domesday Map2 (Part 9) - Manors affected by Invasion. Domesday Map3(Part 10) - Map of values of manors expressed in percentage terms. Domesday Analysis(Part 11)- Graphs and maps. Bayeux Tapestry Plate 1 and 2 (Part 13) - Westminster Abbey and St Michael's Mount. Bayeux Tapestry Plate 3 and 4 (Part 14)- Dol and Rennes. Bayeux Tapestry Plate 6 (Part 16) - Boat making. Bayeux Tapestry Plate 7 and 8 (Part 17) - Tree Felling and Ship scene. Bayeux Tapestry Plate 9 (Part 18)-William's Ship and Size of fleet. Bayeux Tapestry Plate 10 (Part 19) - Horses landing. Bayeux Tapestry Plate 12 (Part 21)- The first meal. Bayeux Tapestry Plate 13 (Part 22)- Defences at Hastings. ROMAN DEVELOPMENT (Part 31)- Development of Infrastructure. TITHE MAP (Part 32)- and Bore Hole Survey. PORT AREA (Part 33)- Port Area. CORRESPONDENCE listing of relevant correspondence and evidence given at Inquiry.